This throw is the number one contest throw. Possibly the reason for this is that in contest people defend and fight in a crouched position with their legs spread wide. This is not an ideal position from which to attack. But it is a natural tendency to retreat into it when competing against a good man. A man who adopts such a position is a sitting duck for uchi-mata. Stand in the right natural posture with the man who is taking the throw bending forward with his leg spread wide. Pivoting on your right foot swing your left foot round and close in behind your right. As soon as your body and left leg have pivoted into position, with your right leg sweep back and upwards into the top of the opponent's thigh. This should lift him into the air. Now pulling strongly with your left hand across your body turn your man in the air and drop him on his back. The important point with this throw is to turn completely round so that you are facing the same way as your partner. If you only manage to turn three-quarters round the chances are that you will not be able to sweep your man up into the air. As your leg sweeps up into the opponent's crotch your arms should be pulling him strongly forward with your head dipping down towards the mat. For a smaller man it is necessary to put his left leg through or between the opponent's leg when he first starts to pivot so as to get right underneath. If necessary in the sweep be prepared to stretch your leg up almost vertically with your forehead brushing the mat. It is this extreme range of the throw that makes it very difficult to stop when once the thrower has got into position. The whole movement of the throw should be as fast as possible especially the initial leg movements. One of the counters for this throw is to get out of the way of the sweeping leg by jumping slightly to the right side and closing your own legs together. If the thrower is attempting the throw properly by putting his heart and soul into it he should go sailing past and turn a complete somersault by his own efforts. This gives an indication of the amount of effort to put into this or any other throw. In this throw the thrower should make sure that he does the throw so fast that he doesn't give his partner time to get out of the way or close his legs. There is a tendency when practising this technique to take undue regard for the opponent's comfort. 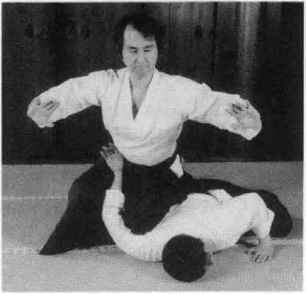 Providing you sweep into the opponent's crotch with the broad expanse of upper back part of your right thigh it should cause him nothing more than a slight uneasiness. As can be seen, the preceding three throws are for use against somebody leaning forward. To get the best effect in practice try to combine them with one of the rear throws of the leg throw section. If you attack strongly with a leg throw to the rear the opponent should react by bending forward. As soon as you get this reaction come strongly in for one of these forward throws and if you fail in this because your partner suddenly braces back instantly try a rear throw again. An example of this is inner leg sweep (o-uchi-gari) followed by the inner thigh (uchi-mata) followed by inner leg sweep again.